Here's one problem with $490 million in transportation funds headed to the San Francisco Bay Area, as part of $787 billion economic stimulus plan enacted by Congress and President Obama last week: Much of the money will go to refurbish buses, train systems and fill potholes, but not much will go to adding transit to the already congested Bay Area. 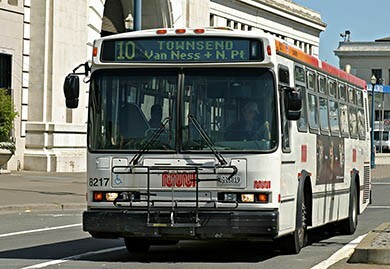 The plan being looked at Wednesday by the Metropolitan Transportation Commission would give $270 million to refurbish buses, BART tracks and hardware; $118 million to fix potholes and roadbeds; and $70 million to add trains between BART and the Oakland airport, according to a Contra Costa Times story. BART is the Bay Area's version of a subway system, although much cleaner than many of its urban counterparts. Preventative maintenance on buses and repairing train tracks is necessary, for sure, and will create or at least keep some jobs, but commuters waiting for more buses or trains to arrive might prefer added routes or additional trains. The $787 billion economic stimulus package is one of the biggest rescue efforts in U.S. history, with transportation playing the biggest role: $27.6 billion to highways, $8.4 billion to improve public transportation, and $8 billion for high-speed rail and intercity passenger lines. Maintenance is always a good idea, but it's like taking your car to the repair shop again and again as things break down. After awhile, it's less costly to get rid of the old car and buy a new one.